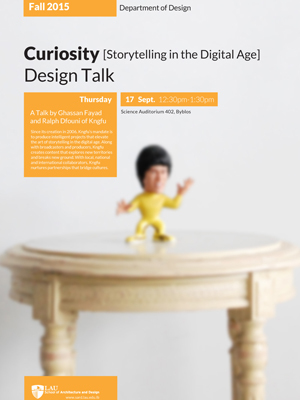 The Department of Design will be hosting a design talk on Thursday September 17, to be given by Ghassan Fayad and Ralph Dfouni of Kngfu. Kngfu’s mandate is to produce intelligent projects that elevate the art of storytelling in the digital age. Along with broadcasters and producers, Kngfu creates content that explores new territories and breaks new ground. The event will take place in the Science Auditorium 402, at LAU Byblos.